Carl Johan Calleman was born at the exact midpoint of the month named from the Roman goddess Maya (May 15, 1950 12am), which is also the day 5 Jaguar in the traditional Sacred Calendar of the Maya. He is the author of three books on the Mayan calendar, Maya-hypotesen (in Swedish, 1994), The Mayan Calendar (Garev, 2001) and The Mayan Calendar and the Transformation of Consciousness (Bear and Co, 2004). He has consistently upheld the value of the traditional Mayan calendar system and was invited as one of the main speakers at the conference organized by the Indigenous Council of the Americas in Merida 1998. He lectures and gives courses about the traditional Mayan calendar across the world. Carl also has a PhD from the University of Stockholm and has been a Senior Researcher at the University of Washington in Seattle. He has served as an expert on cancer for the World Health Organization. You can also contact Carl via his web site www.calleman.com/. Carl Johan Calleman, author of The Mayan Calendar, and organiser of the Oneness Celebration, writes that the Venus transit is over for 2004, but there is one more to come in 2012! For this reason, the Oneness Celebration will be an annual event each June 6th until the next Venus transit on June 6, 2012. Carl argues that this is the time frame for the realization of the Age of Enlightenment, as the blossoming of the new World Tree, the Tree of Life, has begun. Judging from the experiences people have had during the Oneness Celebration June 6-8 of this year it seems that an important transformation of the collective human consciousness has taken place. Many experienced a kind of euphoria immediately after the joint processes, while others seem to have been hit by some lighter forms of disease while returning to everyday life. Following the event, many have experienced a quickening of their spiritual process of evolution and some have found it difficult to integrate the rapid transformation of consciousness. As much now seems to happen in a day as would previously happen in a week and the cosmic energies and our experiences of life vary day by day. What is very clear is that since then many people have become more strongly connected with the cosmic flow of time. This has been expressed among other things as a more developed intuition or capacity for telepathic contact. The mission to initiate the Oneness Celebration was given to me exactly 13 years ago, on July 3 1991 on Orcas Island in Northwestern United States, where I had been called to go seven years earlier. As it turned out, The Oneness Celebration evolved into a global process, that literally spanned from Vancouver to Vladivostok. Global spiritual celebrations have of course taken place before, for instance during the Harmonic Convergence of August 16-17 1987 and the Harmonic Concordance of November 9, 2003. A significant difference is however that these previous manifestations were initiated in the West, in the US, and where the thrust of the participation was in the UK and the US. The Oneness Celebration, maybe for the first time, had a true and balanced global participation. What is it then that makes us experience the changing energies of time so strongly at the present time? Well, actually they have alternating at this rate ever since the First Mother planted the new World Tree, which we may also call the Tree of Life, on January 5, 1999. Already as this happened the Galactic Underworld was initiated. 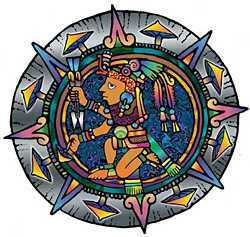 Yet, the Quetzalcoatl energy that was projected onto the Earth by the Sun at the Venus Transit of June 8 served as an activator that has strongly enhanced the experienced of the rapid energy shifts in the cosmic plan as these are described by the Mayan calendar. Prior to this Transit the experience of the energies of time was not as strong and the shifts between uinals [mayan months - ed.] have become much more marked, at least for those whose life projects are aligned with the cosmic plan. The Oneness Celebration meant that the new World Tree has been rooted. This Tree of Life generates new and strong feminine energies in accordance with the time plan of the Mayan calendar and so the powers of the Goddess will increasingly manifest themselves in human life. These powers serve to balance the creation field that has dominated this planet ever since the First Father raised the old World Tree on June 17, 3115 BC. It may then be time to take a look at how this World Tree and how its balancing effects look in actuality. In the figure attached, we may see how the World Tree raised by the First Father in 3115 BC created the polarity of the National Underworld that favored the Western hemisphere of the planet. Through holographic resonance this polarity then also favored the left halves of our brains and because of the unequal distribution of light between the two hemispheres (whether global or cerebral) a world of patriarchal dominance emerged. As a result of this polarized yin/yang field ruling the world organized warfare emerged as a means of establishing and securing dominance. As the energies shifted, especially according to the baktun shifts of the Mayan Long Count, the relationships between various powers, dynasties and nations would also periodically shift resulting in the process that we usually call human history. The point to realize here is that the very phenomena of patriarchal dominance and organized warfare came about as results of a shift in the consciousness field of the Earth that was established as the First Father raised the World Tree (often called the Tree of Knowledge because of its link to left brain thinking). The Biblical metaphor for this is that humans were expelled from the Garden of Eden, and as is often depicted in Medieval paintings, the Tree of Knowledge came to separate the primordial members of the two genders, Adam and Eve. On January 5, 1999 a New World Tree was however raised by the First Mother. This Tree of Life created an inverse polarity, which favored the Eastern Hemisphere and the right brain half, in principle increasing the role of the intuitive powers of people all over the world, and maybe especially its women. Yet, as I had already predicted before the onset of this Galactic Underworld the raising of the Tree of Life led to a sharp increase in hostilities between East and West. These followed upon the most peaceful period in human history, 1992-1999 after the Cold War had come to an end. Why was it then that I was able to make such a prediction that we later saw manifested not only in a fairly persistent terrorism emanating from certain Muslim groups, but also in an ongoing warfare from the West, especially the UK and the US, in Kosovo, Afghanistan and Iraq as well as an intensification of the Israeli-Palestinian conflict? The principal reason is that also the New World Tree of the Galactic Underworld creates a dualist mentality. What is more, this particular dualist mentality threatens to generate a collapse of the patriarchal order that has ruled the world ever since the beginning of the National Underworld about 5100 years ago. It seems obvious that not everyone will be amused by such a collapse, and certainly not the patriarchal religions whose power have been based on the Tree of Knowledge dominating the National Underworld. We should then note that as the two creation fields generated by the two different World Trees are superimposed on each other and merged there are two possible outcomes in an individual in resonance with a unification of these two different fields. This is shown in the attached figure, where two different syntheses are shown both on a global and cerebral scale. What this means is that, as the yin/yang-polarity of the Galactic Underworld pulse by pulse is strengthened, a person in resonance with the two fields may choose to unify either with the yang (light) or yin (dark) aspects of the two creation fields, and this largely depends on the relationship he or she entertains with the Divine. It would be wrong to say that people now are being separated into the “good” and the “evil”, but clearly people will walk paths into the light or into the darkness as the Galactic Underworld progresses. It is undeniable that this rings a bell of the separation of people into two categories towards the end of time as has been prophesied especially by the monotheist religions. Yet, there is nothing to indicate that there would be any “chosen” ones. Humbleness and wisdom may be the most important determinants for what synthesis we are moving towards and it seems certain that those that chose the light will experience more hope and those that chose the darkness more of despair. Read part two of The Oneness Celebration and the new World Tree. Carl Johan Calleman is the author of Solving the Greatest Mystery of Our Time: The Mayan Calendar (Garev, 2001) and the The Mayan Calendar and the Transformation of Consciousness He lectures and gives courses internationally on the Mayan calendar.